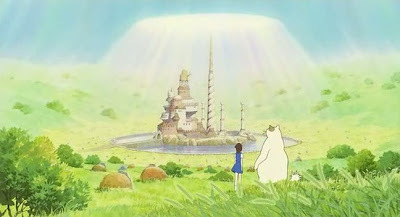 Studio Ghibli, as a rule, doesn't do sequels; this is a core value stated outright by company leader Miyazaki Hayao, who has categorically refused to follow-up on any of his own stories, and the rest of the company's artists has seemed content to follow suit (one must wonder what Miyazaki's buddy John Lasseter thinks about this eminently reasonable position, and if it gives him a twinge of guilt as he sits in on the Cars 2 marketing meetings). There is only one exception to this rule in 17 features released across 24 years, though calling 2002's The Cat Returns a sequel to 1995's Whisper of the Heart is only marginally accurate; far wiser to call it a "spin-off", featuring only a couple of characters who appear in both, and a fantastic, swashbuckling tone that is not remotely similar to Whisper's laid-back realism. 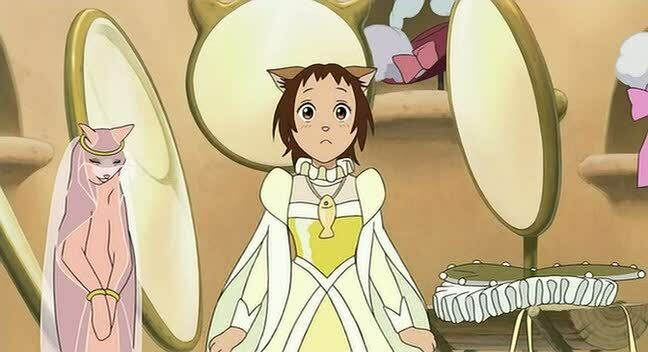 At any rate, The Cat Returns was not even supposed to be a theatrical feature. Not unlike the studio's earlier Porco Rosso, it was born as a commissioned project, when a theme park approached Ghibli about making a 20-minute cartoon about cats. That commission went absolutely nowhere, but by the time it crapped out, Miyazaki had already ordered a manga from Hiiragi Aoi, the author of the source material for Whisper of the Heart. For as soon as he'd heard the word "cats", Miyazaki knew that he wanted to build a story around the mysterious Baron from the older movie, the wonderful doll found in a marvelous antique shop who played such a strong role in the fantasy world created by Whisper's protagonist through her writing. Baron: The Cat Baron was thus ready even when the immediate impetus for a film had been taken away, and not wanting to reject a good story when it fell into his lap, Miyazaki elected to turn the property into a short direct-to-video project, to serve as a testing ground for Ghibli's younger generation of animators. Now, by 2002, we should all know what happens when Ghibli tried to put together a short, cheap project to test their animators: it balloons into a feature. Kiki's Delivery Service in 1989 and The Ocean Waves in 1993 had already established that tendency, which now became a tradition, after Morita Hiroyuki, who had worked as animator on both Kiki and My Neighbors the Yamadas, presented the bosses with 525 pages of storyboards for the "45-minute" project. In short order, he was dropped into place as the first-time director of a film renamed The Cat's Repayment, or The Cat Returns for anglophones, a slightly less accurate title that rolls of the tongue a bit easier. These stories never have happy endings: Kondo Yoshifumi, who directed Whisper of the Heart, died tragically a couple of years later, while Morita has not worked with Ghibli since, moving on to animate Innocence: Ghost in the Shell and Kon Satoshi's Paranoia Agent. I am not prepared to say that this is because Miyazaki and fellow Ghibli bigwig Suzuki Toshio took one look at The Cat Returns and were appalled by what they saw: because it's a damn charming and fully entertaining adventure. But if, in 2002, that's the very best that Ghibli's new generation could turn out (a single year after Miyazaki's elegant, gorgeous Spirited Away, remember), then it's probably the case that Ghibli's new generation needed some more practice. The film is undeniably sweet, but it is also undeniably slight, and not remotely as visually rich as we've all come to expect from that company, managing to look even cheaper than The Ocean Waves did. You might even catch me calling it the worst Ghibli film at the time of its release (or rather, the least-great Ghibli film &c.), but let's set that aside for the moment, and take a look at the darn thing already. Our heroine is a high school girl, Haru (Ikewaki Chizuru), who is a bit of a disaster: the first time we see her, she's overslept, and that's even before we find out how clumsy she is, or how her best friend seems to keep her around to be the but of jokes. Things start to change when, in a fit of thoughtless heroism, Haru saves a grey cat from a semi truck; it turns out that this is Lune (Yamada Takayuki), the prince of the cat kingdom, and his father the king (Tanba Tetsurô) is so grateful that he gives her all the rewards his kingdom can provide: a field of cattails outside her house, and all the mice and catnip she could hope for. This is merely annoying; Haru only realises how terrible her situation actually is when the king's messenger, Natoru (Hamada Mari) comes and tells her, delightedly, that she's about to be married to Lune. 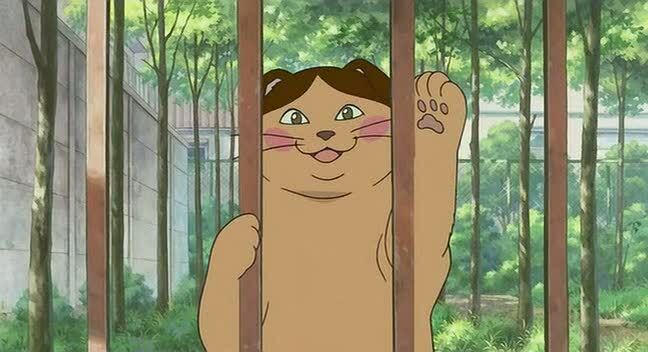 Haru is naturally horrified at this, and follows the advice of an unseen voice to find "the Cat Bureau"; there she enlists the help of the Baron (Hakamada Yoshihiko, replacing Tsuyuguchi Shigeru), along with the magnificently fat Muta (Watanabe Tetsu), also coming from Whisper of the Heart (where he was a very real cat, who did not talk), and the enchanted stone raven Toto (Saitô Yôsuke). Just in time, for Natoru is right behind her with an army of cat soldiers to bring her to the cat kingdom, where she begins to transform into a human-feline hybrid. And it's here that the plot goes absolutely nuts, a devil-may-care melange of Alice in Wonderland and The Three Musketeers, with a dash of The Nutcracker for good measure. With this much incident packed into not very much movie (at 75 minutes, The Cat Returns is the shortest of Ghibli's theatrical features), it's certain that nobody could be bored, but I must be honest: it's all a little too hectic for me, with virtually no emphasis on character whatsoever. And character, of course, is at the center of every Ghibli film, even the ones that look like they're otherwise just pure spectacle and incident, like Spirited Away. Or maybe I'm just dissatisfied with the visuals, and that's getting in the way of everything else. By no means does The Cat Returns represent some kind of low ebb of animation: it's still animated fluidly, and there's a wide-ranging color palette, and the details in some shots are truly mesmerising. Yet there's something about the character design especially that just screams "THIS IS A CARTOON" in the wrong kind of way. 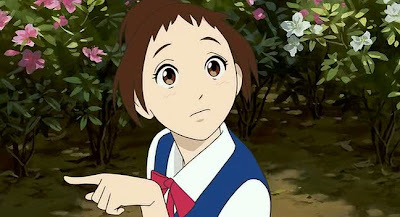 Haru herself just has a certain quality, the shape of her chin, the position of her eyes, the way that she's given the rudiments of features rather than features per se, that makes her, to me at least, remarkably unappealing for a Ghibli protagonist. The same general aesthetic is a constant in the movie, but with an almost exclusively non-human cast, it's not so hard to be bothered by the striking lack of detail. Indeed, the depiction of the cats in the film is buoyant and rather funny, which works to great advantage in the early scenes. 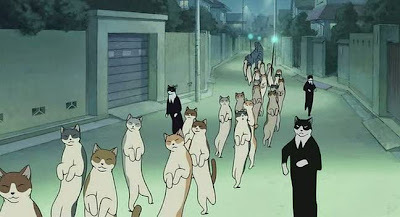 For in the early scenes, The Cat Returns is something very different than it turns out to be: here, it's just a comedy about over-eager anthropomorphic cartoon cats trying much too hard to please a girl who's done everything she can to be unseen. The round, goofy look of the cats - and even Haru, to an extent - works here, because there are no real narrative stakes. It's a silly little movie; the silly aesthetic fits it. As the film progresses to its relatively more serious adventure plot - and by no means does it stop being silly, but its silliness is augmented - the half-formed look begins to work against it, particularly as we're meant to take Haru's travails more seriously. Though the scenario and Ikewaki's vocal performance both make her out to be a sensitive, interesting character, it's just too hard to relate to someone who looks like that, and as she begins to fear that she might be trapped as a cat in the cat kingdom forever, we're kept at a remove from her, because frankly, she looks better that way. At the very least, she has a damn nose now. Even discounting these design problems with design, The Cat Returns never makes especially deep emotional demands on the audience; or really any emotional demands on the audience at all (though one scene, in which Haru learns the identity of the cat she fed as a stray many years earlier, had me going "aww"). It's the one Ghibli film that really does seem like it's just meant to be a frivolous kids' movie, and though the bulk of Ghibli's output is at least family-friendly, they never otherwise made a movie that has so little humanity to it. Maybe that's what happens when you set a story in the kingdom of cats: they're not very humane animals. Or maybe it's just the film revealing accidentally that it was never meant to be an A-list project for the studio. Whatever the case, it rarely hits the levels of the studio's greatest pictures, though of course you can't force excellent artists to make bad art, and so even here there are moments which embrace the possibilities of animation, enough to make your breath catch for a moment. For example, the uncanny sight of cats walking on their hind legs down a nondescript (but wonderfully-realised) suburban street. And when it comes right down to it, you can't really complain about a kids' movie that crackles along this fast, telling a fun story with economy and energy and brightness. It may lack the ambition of pretty much everything else Ghibli ever produced - and it does say something, doesn't it, that a story of talking cats and a girl rescued from a mad king by a heroic talking doll can seem "unambitious" next to stories about a suburban family, or a young woman reflecting on her school days - but it's still good, better by far than most animation of the same period. It respects its audience and does not look to talk down to children, and it's never so concerned with being a cartoon with all the edges taken off that it can't be mostly entertaining, if shallow, even to an adult viewer. Only from a studio that knocks one masterpiece after another out of the park can such a thing possibly count as something of a disappointment.